When I was growing up, my mom used to make a dozen blueberry muffins fresh, from scratch, almost every morning. Those muffins were LEGENDARY. My brothers used to devour them as quickly as she could bake them. I was actually indifferent to blueberry muffins (a fact I didn't tell her until much later), but my friends used to pretty much fall all over themselves to see who could claim the fresh-baked muffin in my lunch. A nice homemade muffin is such a comforting treat....if it's fresh, it has that delicious crunchy top, the sweet taste, that feeling of satiety....yum. Somehow though, in the unnamed number of years since I had my mom making my lunch (we'll just say it's a lot more than 10), the muffin has morphed. It's gone from a few bites, to a cake-like monstrosity sugar bomb. So muffins have a bad rap now (unlike the nutrition halo enjoyed by granola bars). I maintain that muffins can totally be part of a tasty snack or breakfast, we just need to do a few things with them. We need to make them smaller. We need to cut the sugar. And we need them to be whole grain. Because I also love chocolate chip muffins, I'm going to use the Tim Hortons Chocolate Chip mufffin as a comparison. Weight - TH has a 115g muffin. My muffins weigh between 50g and 68g. Calories - TH is 410 calories. A muffin should not be 400 calories. 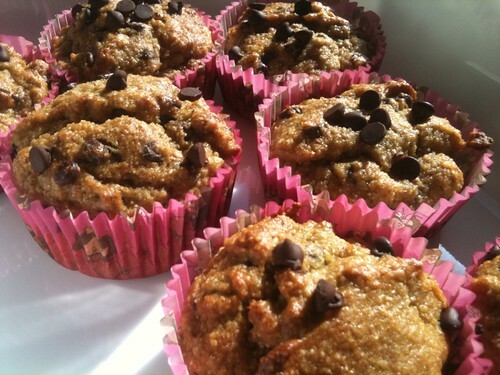 These muffins are about 181 calories. Sugar - TH is 37 g. That is almost 10 teaspoons. Mine have 8g. That's about 2 teaspoons. They still taste sweet. Fibre - TH has 2g. Mine have 4g, despite being half the size. Sodium - TH has 430 mg. Mine have 94 mg.
Bottom line, these muffins are denser, pack more fibre, way less sugar and sodium. They are about equal in terms of fat, but mine get the fat from avocado and canola oil. I got this recipe from the October 2012 issue of Clean Eating, and just tweaked it a wee bit. It's not my recipe but it's so yummy, and I couldn't find it online anywhere to share it with you. So I'm posting it. And the picture is from my phone, so it is sub-par. I'm feeling lazy, and didn't feel like dragging out my DSLR. 2. Line a muffin tin with papers, or mist with cooking spray. I let Lil Z pick the papers. 3. In a large bowl, combine flour, sugar, baking powder and salt. 4. In a medium bowl, place the avocado and banana. Mash with a potato masher/pastry blender/fork. Lil Z helped with this too. Add eggs, oil and vanilla. Combine with a whisk. 5. Add liquids to flour mixture, and stir lightly until mostly combined. Add chocolate chips and fold in. Don't overwork your batter or your muffins will be hockey pucks. 6. Spoon batter into muffin cups, filling each about 2/3 full (I use a 1/3 c. measure and don't quite fill it). 7. Bake for 21-25 minutes, until tops are browned. Let cool in pan for about 5 minutes, then remove and let cool on a rack. Voila. According to clean eating, here is the nutritional lowdown: per muffin, 181 calories, 7g fat, 27g carbs, 4g fibre, 8g sugar, 4g protein, 94mg sodium. These are DELICIOUS. Hubs, who normally eschews my chocolate chip muffins in favour of my mother's blueberry ones (apparently chocolate chip muffins are juvenile?) just loves them. Lil Z hasn't tried them yet, but I am willing to bet that she is going to just love them. And I love that I've given her something that's packed full of healthy fats, satiating fibre, and just enough chocolate to make it all yummy. Had to post this because you NEED to make these muffins. Dense and delightful. Lovely dear, I also added some chocolate syrup in it and it was great served with tea and coffee.